Datamaran - the leading solution for non-financial risk management - launches its user certification program. LONDON - 23 October 2018. 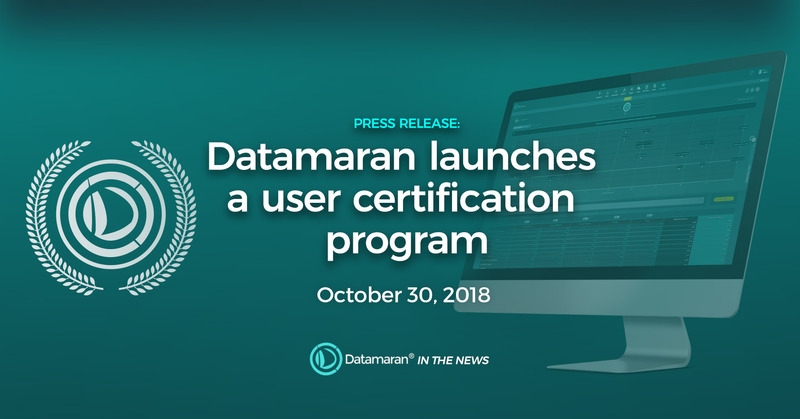 Datamaran - the leading solution for non-financial risk management - announced today a launch of a user certification program for Datamaran 4. The purpose of the program is to empower Datamaran customers to achieve high proficiency in using and applying Datamaran 4 to various internal use cases. The ultimate goal is to help customers to take a full ownership of benchmarking, materiality analysis, and issues monitoring processes in-house. A six-week program that comes complimentary to all customers helps users achieve proficiency at their own pace. Followed by an exam, the program provides with a collection of interactive lectures, audio-visual materials, coursework, as well as custom analysis template. Depending on corporate needs, customers can choose between “ScubaDive” for benchmarking or “DeepDive” for materiality analysis courses. Both options come with the “JumpDive” course, which gives a general overview of Datamaran 4, as well as the latest best practices from the corporate sustainability field. Disclaimer: Please note Datamaran Certification does not replace high-quality customer support, its aim is to empower customers to make the most of Datamaran and to take a full ownership of benchmarking, materiality analysis, and issues monitoring processes in-house. An overview of the certification program is available here. For any press enquiries or for an interview with Maeva Charles please contact Saskia Ligteringen at saskia@datamaran.com or on +44 2077029595.